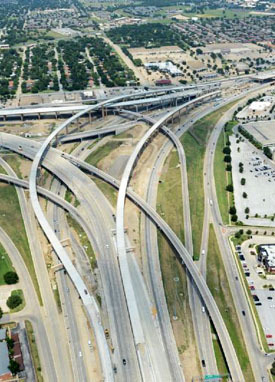 Expansion of the Loop 820/SH 121/SH 138 interchange as part of the North Tarrant Express during construction in 2013. 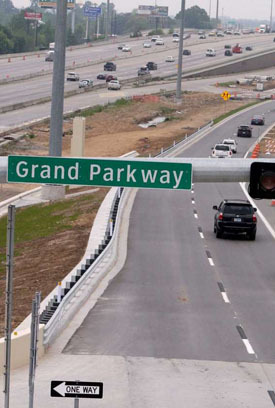 Six segments of the Grand Parkway SH 99 loop around Houston are now open, stretching from Interstate 69 near Rosenberg, north to Katy then north and east to I-45 at Spring and then to I-69 north of Kingwood. The Texas House voted 79 to 52 on May 5 to defeat HB 2861 which would have continued to provide TxDOT and RMAs authority to use Comprehensive Development Agreements (CDAs) to finance and build certain specified large projects. The bill included permissive authority to use CDAs on 18 projects including three in the Austin area and two each in the Dallas, Houston and San Antonio metro areas. Another seven were in the Lower Rio Grande Valley. Victor Vandergriff, one of the five members of the Texas Transportation Commission, told the Texas Tribune, "All those roads will be challenged. We will have to come up with some other source of funds." He said it could take months for transportation officials and regional planners to decide whether to delay those projects or divert money currently programmed for other highways to those named in HB 2861. CDAs are a form of public-private partnership (P3) used to leverage private investment and share risks and responsibilities for the design, construction, and in some cases financing, acquisition, maintenance, and operation of transportation projects. Currently TxDOT and regional mobility authorities (“RMA”) are authorized to develop certain projects approved by the legislature and specified in statute through the CDA delivery model, but that authorization expires on August 31, 2017. Unless reauthorized, the CDA tool will be lost. Even with recent funding improvements (e.g., Propositions 1 and 7) Texas remains well short of available funding for critical transportation projects throughout the state. CDAs offer a means of maximizing funding, and an opportunity to supplement limited state funds with significant private sector investment that can deliver needed projects and provide for long term maintenance and operations. The current federal administration has expressed an emphasis on a significant infrastructure investment with a program likely to rely extensively on private sector investment and P3 project-delivery. If Texas does not re-authorize CDAs, it will lose the ability to access those elements of the potential federal program. CDAs transfer construction risk, and in some cases financing and revenue risk, to the private sector while delivering significant projects for public use in an expedited manner. By considering technical proposals in the procurement process for CDA projects, CDAs encourage innovation in project design and delivery leading to more advanced transportation solutions and in some instances significant cost savings. CDAs can significantly reduce the time needed to deliver large transportation projects, thereby accelerating mobility, economic development and air quality improvements. As a result of private sector investment through CDAs more than $8 billion in major infrastructure projects have been delivered with only $1.4 billion in state and local funds. CDAs can include revenue sharing arrangements, so that a region where a project is located receives the benefit of a long-term revenue stream available to support other projects. CDAs can also include up front payments for the rights to develop a project. The Metroplex received $3.2 billion related to the SH 121 project (essentially a CDA by a public sector entity (NTTA)), and those funds have been used to expedite approximately 200 additional transportation projects. CDA projects are subject to initial review and consensus by local stakeholders and TxDOT in relation to a project’s financial risk, method of financing, and tolling structure and methodology. CDA projects are always owned by the public sector (i.e., TxDOT or an RMA); CDAs do not convey private ownership of public roadways. - Termination clauses that allow TxDOT or an RMA to acquire the interest of the CDA developer prior to the end to the contract term if necessary or in the public interest. - Agreements are subject to reviews by the Office of the Attorney General.